As you've seen, we've already written the obit, but what about the issue itself? 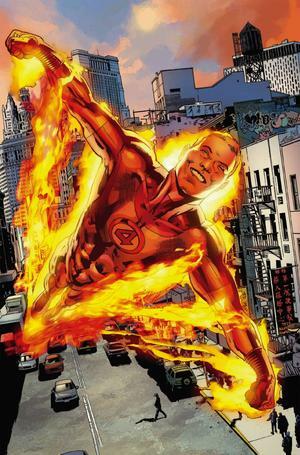 Is it a just and fitting end to Johnny Storm aka The Human Torch? A little background first - I'm a Marvel Girl. While I started getting into DC a few years ago, Marvel is what I always come back to. It's like an old friend. X-Men are my primary group, but for a good while, I was collecting all X-titles, Avengers, Spider-Man, and the Fantastic Four, with the random Hulk, Iron Man, Thor, etc. thrown in, depending on what major event was happening. Lack of funds and convoluted storylines caused me to scale back considerable, but I've always tried to stay informed about what was going on with Marvel Universe. 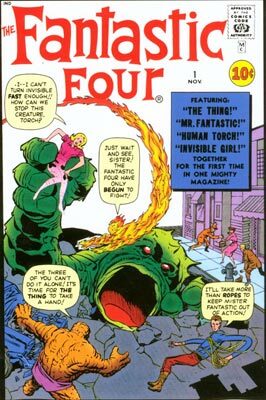 I'm a little sad to say The Fantastic Four were not as interesting to me as Spider-Man or the Avengers, yet I've always had a major soft spot for Ben Grimm and Johnny Storm. I loved them together, as well as when they went on individual adventures. When I heard they were going to kill one of the Four I didn't really believe it. We all know no one truly stays dead in the MU, but the thought of one of them dying kinda sucked. For some reason I wouldn't allow myself to think it would be Ben or Johnny, though deep down I knew they were the logical choice. Even my dad, who gave up reading comics in the 80's, said it was going to be one of them, probably Johnny. So how was it? I bought the issue without knowing what's been going on the last few issues, so it's a little confusing. Reed is off trying to save a planet from Galactus (when isn't he? ), Sue is under water dealing with political situations with Namor (surprise, surprise), and Johnny and a de-powered Ben are trying to fix a breach in the Negative Zone portal, with the help of the Future Foundation, which includes the Richards' kids, Franklin and Val (is Franklin ever going to age?) and a couple of my old favs, Artie and Leech. I'll be honest, Reed's story held no interest for me because I didn't have a clue what was happening, but Sue was awesome! She somehow becomes a Queen of the Ul-Uhari (? ), and she declares them under her protection from Namor. Namor being Namor, tries to argue with her in a prickish manner, so she knocks him down, and when he gets all pissed about it, she puts him in his place. *Side note - Another reason I gave up on FF was that I really hated how weak Sue was portrayed. She just seemed like the team's weakest link and like a pushover. It was fantastic to see Sue being strong and in charge, and I can't help but smile whenever I hear or read a woman say, "And I'm a queen that bows to no king." Can't help that. On to the important story - I won't go into all the details because that would take away some of its power, but Johnny, Ben and the kids need to close the portal and are having difficulty. It was damaged and they need to go over to the Negative Zone to manually close it. They can't close it and all make it back; someone needs to stay, and you know who makes the choice. Johnny makes his Stand, and it is beautiful. What makes this a great issue is even without knowing and fully understanding all that was going on, my heart broke. Reed and Sue's stories helped set up future plots, but Johnny's story is very accessible. You understand the sacrifice he's making and why. Jonathan Hickman wrote a great script and Steve Epting, while I didn't always like how he portrayed Johnny (felt he looked a little too old), perfectly captures Johnny's essence, creates one of my absolute favorite pages with Ben, Johnny and Franklin working together, and those last few pages nearly killed me. He captured the strength and love of Ben and Johnny's friendship, Valerie's determination to get him back, and the agony on Ben's face as he watches Johnny before the portal closes. I take it back, it broke me and my heart. Each time I look at those final pages I tear up. If the Human Torch is going to go out, this is how it should be, but the thought of never seeing him say "FLAME ON" is not something I am comfortable with. I understand there is a much bigger arc in store for the Fantastic Three, but this is one case where I really do hope the dead rise, in a non-zombie or vampire way, and once again, we get to enjoy the antics and heroics of Johnny Storm. Until then, I guess I'm going to be keeping a much closer eye on the Fantastic Three to see how they carry on. What did you think of the issue? Did it do Johnny justice or would you have liked to have seen something different?